Here is a wonderful source of teddy bear baby shower ideas. The world's most popular toy is the Teddy Bear. There is a bond forged between a child and a stuffed bear that lasts a lifetime. 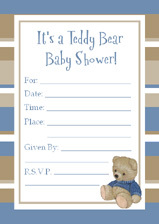 A bond which makes a teddy bear theme a fantastic, furry choice for a baby shower. 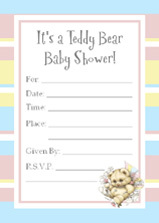 On this page, you have at your fingertips the most comprehensive and cute collection of teddy bear baby shower ideas, tips and printables anywhere on the web! Teddy Bear invitations, games, food, favors, centerpieces and decorations - All your bear necessities you need to plan the perfect baby shower! 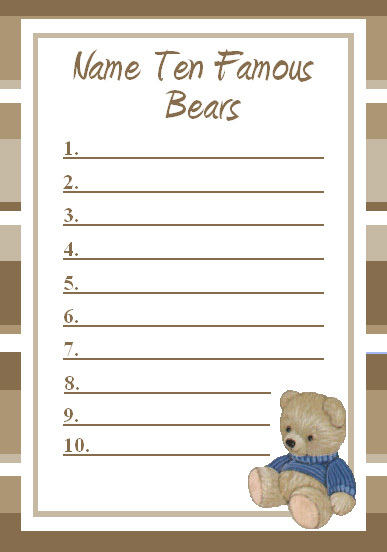 You could make your own teddy bear invitations using teddy bear patterned paper. One of the most popular styles of baby shower invitations these days is the use of vellum. Vellum is a thin, semi-opaque, semi-clear, milky colored paper. How is vellum used? First, go to a scrapbook or craft store and buy some sheets of teddy bear-themed paper (there are usually several patterns and styles of angel printed paper). You can get at least 2 invitations from one 8 ½ by 11 inch sheet (depending on how big or small you make the invitations). A 4” by 6” invitations is a recommended size. Also, at the store, buy the same amount of sheets of vellum. Also buy some ribbon or star shaped brads. You can use either the ribbon or brads to fasten the vellum to the paper. 8 Months Along and Bearly Hangin' On! Heather and her little boy areregistered at Target. Next, cut your teddy bear themed paper to 4” by 6” size. Then place the vellum on top of the teddy bear-themed paper and fasten it at the top with two star shaped brads, equally spaced in the center. Or punch two holes, equally spaced (about 1-2 inches apart) in the vellum and the paper; then loop come ribbon through both the paper and the vellum. If you don’t want to use vellum, you could follow the instructions above, but instead of printing the wording onto vellum, just print the wording on a light-colored teddy bear patterned paper. Cut to size and you are done! We want both the decorations and the centerpieces to be hip and cute. We are not going for the Yogi bear, cartoonish look here, we want some real style! Vintage Teddy Bear also screams, "BUTTONS"! Buttons were the common vintage eyes for teddy bears of days gone by. So sprinkle a few piles of buttons around the room, or use them instead of confetti. Buy, borrow or gather as many teddy bears as you can. Create displays throughout your party room. Put a bear or two on the gift table and on the food table. You could borrow some chainsaw bears and put them on the front porch with a sign that says "8 Months Along and Bearly Hangin' On!" Buy some bear confetti and sprinkle it around the gift table and food table. Buy a bouquet of flowers, mostly brown ballons with either baby blue or light pink balloons sprinkled in the bouquet. Tie these to the gift table or the chair where the mother-to-be will be sitting. You could make a teddy bear diaper cake. It's not that hard at all and look how cute they are: click here to see some teddy bear diaper cakes that our users have submitted. Here are easy to follow diaper cake instructions with step-by-step pics! Flowers are always classy and hip. Buy or create a flower bouquet centerpiece with plastic bees (from a craft store) placed on the bouquet. Here is a cuddly game that everyone will enjoy! Test everyone's knowledge of Teddy Bears with this fun Teddy Bear trivia game! How many famous bears do you know? Corduroy, Paddington, Pooky? Name as many as you can with this fun Famous Bear Name Game! How long does a bear's pregnancy last? An elephant's? A mouse's? You'd be surprised! Find out with this animal pregnancy game - these free printable game cards are ready to use and fun to play! The CUTEST and tastiest idea for a Teddy Bear favor that is INEXPENSIVE is this: Chocolate dipped cinnamin bears! In a double broiler, dip a bunch of cinnamin bears into brown melting chocolate. Then put 6-8 bears in a cute little satchel or favor bag. You could buy little containers of honey that look like bears. 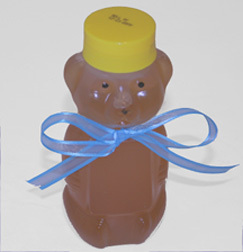 Then tie baby blue or light pink ribbon around their necks and then give each guest a loaf of bread and a jar of honey! A fun and delicious bear-related menu should consist of: HONEY! Bears LOVE honey. So that will be our common thread throughout our teddy bear baby shower menu. DIRECTIONS In a large bowl, whisk together oil, honey, soy sauce, and pepper. Before adding chicken, reserve a small amount of marinade to brush onto kabobs while cooking. Place the chicken, garlic, onions and peppers in the bowl, and marinate in the refrigerator at least 2 hours (the longer the better). Preheat the grill on high. Drain marinade from the chicken and vegetables, and discard marinade. Lightly oil a large skillet or frying pan. Put the chicken and vegetables in the pan and cook for 12 to 15 minutes, until chicken juices run clear. Brush with reserved marinade frequently. Place about 3 or 4 tablespoons of chicken and vegetables on each tortilla, roll up and fasten with a toothpick. Bring a large saucepan of salted water to a boil. Add carrots and cook until tender crisp, 10 to 12 minutes. Add pea pods and cook until tender crisp; drain and set aside. Melt butter in the same pan and stir in cornstarch. Return carrots and peas to pan and stir in honey. Cook over medium heat, stirring occasionally, until heated through. And For Dessert? Scones with honey butter, truly mouth watering! Don't think I have ever met anyone that doesn't like scones. Preheat oven to 425 degrees. Mix ingredients in bowl and pour into 9x9 glass baking dish or cast iron skillet. Bake for 12-15 minutes or until knife or toothpick inserted in center comes out clean. Let cool slightly. Run knife around outer edge and then cut into squares or wedges. Serve warm with honey butter (or you could serve them with ice cream and fresh berries, but then you kind of lose the bear-honey aspect of it). 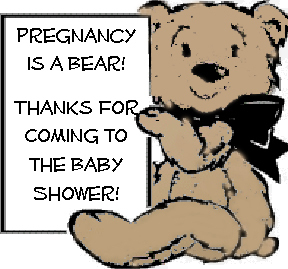 BEST WISHES on your Teddy Bear Baby Shower!! I hope these ideas help you. 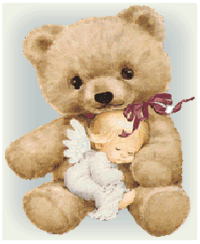 Remember: "A bear teaches us that if the heart is true, it doesn't matter much if an ear drops off."